What is Excel Power View Tutorial? Power View enables interactive data exploration, visualization, and presentation that encourage intuitive ad-hoc reporting. Large data sets can be analyzed at the fly using flexible visualizations in power View. The data visualizations are dynamic, consequently facilitating ease of presentation of the data with a single power View document. This manual targets professional with hands-on experience in Excel, to perform the high-end facts analysis and decision making in a matter of few minutes. Power View is based on the data model in your workbook. Both you could begin with a data model that is already available in power Pivot and you can create a data model from power View itself. in this tutorial, we expect that you are aware of the data model concepts in power Pivot. 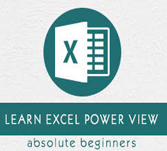 Otherwise, we advise you to go through our Excel power Pivot tutorial first.